Who doesn’t like a salty-sweet treat? 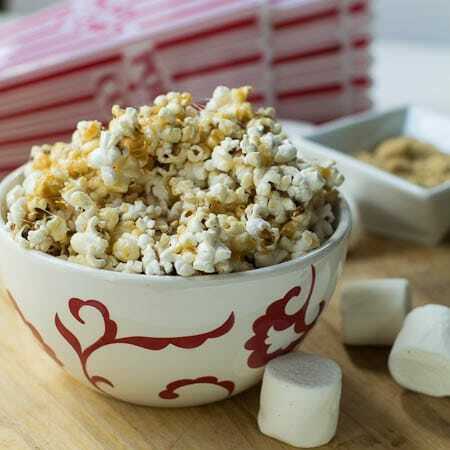 With tons of brown sugar, butter, and marshmallows, this Marshmallow Caramel Popcorn is a little heavier on the sweet. It’s buttery, ooey, gooey, deliciousness at its best. Warning: You may want to portion off a small portion because once you get started popping these soft, caramel popcorn pieces in your mouth, you won’t be able to stop. 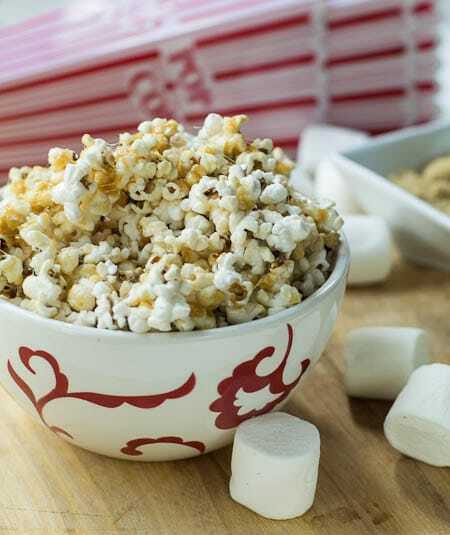 Marshmallow Caramel Popcorn will stay sticky and soft. Store in an airtight container if you don’t gobble it all up. 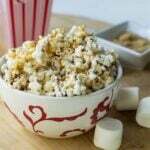 If savory popcorn is more your thing, give this Rosemary Olive Oil Popcorn a try. I love the flavor combination. Place oil and 2-3 kernels in a large pot, cover, and heat over medium heat. When kernels pop, add remaining kernels in a single layer, sprinkle with a little salt, cover, shake well, and continue to heat over medium heat. When popping slows down to a few seconds between pops, remove from heat. Place brown sugar and butter in a microwave-safe bowl and microwave for 2 minutes. Add corn syrup and marshmallows and microwave until they are melted, about 1 ½ to 2 minutes. Stir and immediately pour over popcorn and stir to distribute. This entry was posted in Snacks and tagged caramel popcorn, Madison Park Foods, popcorn, snacks. Bookmark the permalink. Are you sure about the 2 minutes the butter and brown sugar boil in the microwave? Is it supposed to turn out hardened? At least 2 minutes, if not more Barbara. It should be boiling. I wouldn’t be able to stop eating this! I think a little pb would make a great addition too. You’re not kidding around with this stuff. I don’t know that I’d be able to concentrate on the TV screen if this were part of a movie night! Oh man, I need this popcorn in my life. I can’t get enough of the sweet/salty combo. I really need to make popcorn more often!